TG Precious Metals & Diamonds address, phone, website, hours of operation, and more. TG Precious Metals & Diamonds started in 1981 by our jewelry experts that have more than 30 years of industry experience. Located in Dayton, Ohio, we are one of the leading jewelers in the Cincinnati and Columbus, Ohio, area. 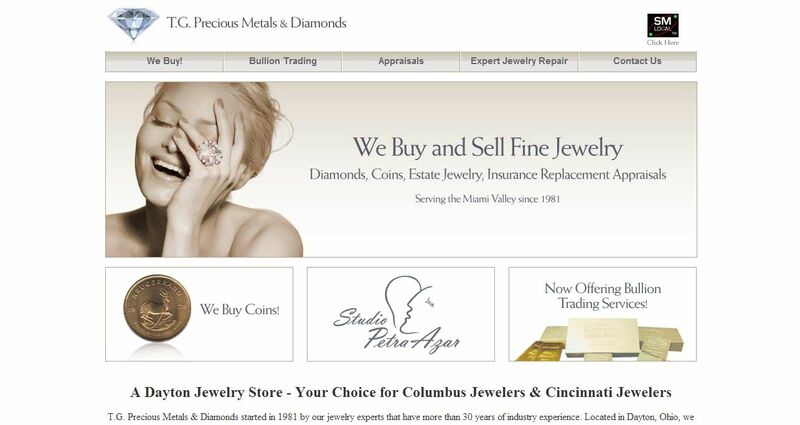 Choose us for your Columbus jewelers or Jewelry stores Cincinnati. We specialize in buying gold and silver diamonds of any size. We also offer jewelry repairs and offer some same day service for your convenience. Additionally, we sell jewelry – including diamonds, coins, silver bars, and gold coins. We buy estate jewelry including sterling silver, dental gold, broken jewelry, and gold items that are out of style- we buy gold; TG precious metals is one of the most well known gold buyers Columbus and Cincinnati jewelers. We deal in old silver dollars dated before 1935. We have a bullions service of American silver eagle and gold American eagles. We like to buy old gold coins $5, $10, and $20 coins. We also buy bars and coins remnants of stones and diamonds and custom jewelry also.